BIM is a process of creating and managing a digital representation of the physical and functional characteristics of a built asset (an Asset Information Model). This is held in a common data environment and usually contains graphical and non-graphical information. At a very basic level, 2D and 3D modelling can be used as BIM technologies and have been used successfully in asset design for many years, however BIM has evolved. The advent of new technology encouraging interoperability and shared data has opened new avenues within BIM. BIM is a way of standardising the communication of data so that everyone can transmit and view data without confusion. The ethos is one of collaborative processes which help to reduce waste and errors, streamline tasks and produce better quality projects. New capabilities to collect, store and crucially use more asset data were key drivers in this evolution of information management. Besides the traditional benefits of clash detection and design visualisation, BIM now creates real value in the use of asset data through its operating life. BIM is sometimes referred to as Building Information Management, to emphasise the management and use of asset data beyond design. What are BIM Levels and what is Level 2? The Bew-Richards BIM Maturity Model helps the industry understand what each level of BIM implementation looks like. Level 2: Managed documentation and 3D models with file based collaboration and library management. Separate discipline models, stored and accessed in a common data environment. Level 3: Fully integrated, centrally accessed, project / facility model with time / programme, cost and facilities / operational management information. Information shared in “Open” formats such as IFC. These levels show the increasing application of BIM principles. Below Level 0 are traditional, hand drawn paper designs. Level 3 is still being developed, hence it is not possible to work at Level 3 currently. Level 2 is a benchmark in the construction industry, as it is a requirement for all government funded projects from April 2016. Clients other than the UK Government are now requesting projects to be delivered at Level 2, where they know what they will receive and the benefits they will enjoy. As a requirement of Level 2 government projects, project data must be shared via COBie UK 2012 (Construction Operations Buildings information exchange), which is a common structure for the exchange of information in a non-graphical form. Being a structure, COBie can take a number of forms, the most recognisable of which is an Excel workbook. Combined with 3D models and supporting documentation, COBie completes the deliverables requirement for Level 2. Why use BIM Level 2? BIM reduces waste and rework, produces more transparent costing and programmes and better quality projects with greater functionality. This reduces confusion, lead time, waste and cost. The BIM Task Group (www.bimtaskgroup.org) defined BIM Level 2 as a key enabler in generating 20% capital savings and 20% carbon reduction of the asset throughout construction and operation phases. By specifying BIM Level 2 on a project, the client can rest assured they will receive a better quality deliverable, more in tune with their requirements. At the outset of a project, the client circulates an Employers Information Requirement (EIR) document which informs all parties what data is required but more importantly what can be omitted, giving more time to produce data that is relevant and exploitable for the assets purpose. This reduces wastage and produces a more effective and valuable project solution. The Asset Information Model delivered through BIM Level 2 can operate as an asset management tool itself, or alternatively can provide a data feed for existing systems, with no need to search directories or collect information from multiple sources. In short, BIM yields short and long term cash savings, in addition to increased design functionality, reduced carbon emissions and streamlined work flows. How does BIM Level 2 work? At project initiation, the client completes an EIR document, telling all parties what data should be included in the project. All parties respond with a BIM Execution Plan to answer the requests in the EIR, then use this as a guide to developing their design. During design, everyone contributes discipline specific project data, graphical and non-graphical, to a common data environment. This environment controls who can submit and view different information. As the project progresses, the virtual image of the asset is built up which can be used to make project decisions. The key is to gather relevant, exploitable data whether it be about performance, design, cost or another. 2D and 3D elements should be linked to a non-graphical representation, which provide details that can’t be expressed in graphical form. Once complete, the Asset Information Model will be composed of both a 3D model and this non-graphical model, which read together to describe the project. This is then used by the client as a database for the remainder of the assets life-cycle. Where can BIM Level 2 be used? 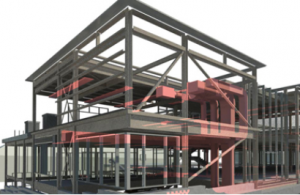 BIM can be used on any construction project. It can even be retrofitted to existing assets, by combining BIM with tools such as Laser Scanning and 360 degree photography. These give us the ability to extract accurate asset data to retrofit a BIM solution. Combined with manual survey data, an Asset Information Model is generated based on the extracted data. What is 4D, 5D and 6D BIM? Extra BIM ‘dimensions’ can be added to a project to increase functionality of the BIM solution. 4D (construction scheduling), 5D (cost planning) and 6D (facilities management) modelling can be used in Level 2 or to work towards Level 3. 4D construction scheduling shows how an asset will be built over time, increasing site coordination, site safety, generating confidence in a project through accurate visual representation and reducing construction costs. It is possible to use 4D BIM in real time by feeding construction data back into BIM, generating a live Asset Information Model. 5D cost planning adds cost data to 4D scheduling, producing cost reports and forecasts based on construction progress, component costs, labour costs and more. Forecasts can be tracked through the project against actual spend to provide a useful budgeting tool. 4D and 5D BIM can be used as high level tools to develop tender information, providing the client with another valuable design resource to consider when awarding contracts. 6D BIM adds details about the lifespan and operation / maintenance requirements of asset elements. This data can include performance information, when to replace parts and the cost of doing so. This is known as Facilities Management and is a highly integrated and powerful tool, capable of forecasting the financial, operational and maintenance requirements of an asset. Introducing 4D, 5D and 6D BIM into the AIM generates further value from the asset throughout its life by reducing unforeseen costs, planning financials more accurately and managing assets more effectively. Like any other element of BIM, these produce the best results when specified from project initiation. As a process, any number of programs and technologies can be employed to provide a BIM solution, however some of the most important elements are COBie, coordinated 3D Modelling and asset management. One of the key requirements of BIM Level 2 compliance as outlined by the UK Government is the exchange of COBie. This is a standardised structure for the storage of non-graphical asset data, often in an Excel workbook. Despite having a building/architecture focus, we have created our own COBie compliant project structure giving our clients access to a powerful BIM tool, the ability to meet Level 2 on projects and reap its wide-ranging benefits. This is one of the most popular methods of developing design data in the construction industry. We were an early adopter of 3D design and have amassed a great deal of experience in its application. Software packages can now generate BIM data throughout the design phase, ready for exporting to a shared environment on demand.